The brand new Holloway Road Nando's will play host to #RYN38BringAMate and we can't wait to see you and lots of your mates in attendance! Nando's finally opens in Bracknell!! 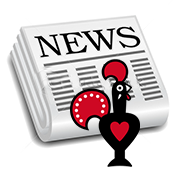 Read more about Nando's finally opens in Bracknell!! Read more about Nando's opens in Wednesbury! Our eighth birthday is upon us and we can't wait to celebrate with you at Farringdon Nando's at 19:30 on Monday 14 August. Read more about Nando's opens in Altrincham!